The A. Lange & Söhne company has its origins in Saxon precision. From a pedigree that dates back to the court of Augustus the Strong, Adolph Lange established his successful watchmaking industry in the town of Glashütte, in the Ore Mountains, during 1868. 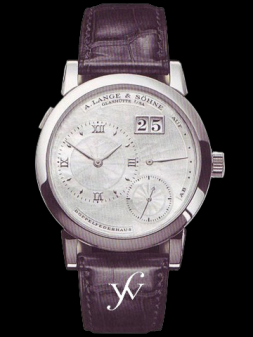 Over the years, the name A. Lange has become synonymous with elegance in craftsmanship. All of the movements used in Lange watches are designed and manufactured on site and in-house. This focus on craftsmanship means that only a relatively small number of Lange watches can be manufactured each year. * Outsize date - Based on a patented two-disc mechanism, this patented feature allows display of the date up to five times larger than conventional watches. * Sapphire-crystal caseback - allowing a view of the movement. * Crocodile leather - Lange uses leather (technically, it is alligator) only from breeding farms that comply with controlled animal husbandry standards. Datograph This watch is considered a technical masterpiece. It was the world's first chronograph that was based on the classic column-wheel principle. This elegant timepiece stops event as long as thirty minutes, with accuracy of 1/5 of a second. A special "flyback" function lets the chronograph be reset to zero during an ongoing measurement - with just one push of a tiny button. New timing begins immediately upon release of the button. Available in either 18-carat pink gold or platinum, this watch is worn on a crocodile strap or precious metal bracelet. Saxonia The mid-sized Saxonia is deserving of its bold and historical name. It has a solid-silver dial, studded with gold, lozenge-shaped markers. The outsize date is featured in a double-aperture gold frame. Of special beauty is the sapphire-crystal case back, which allows a glimpse of the superbly designed movement. This piece is available in a polished 18-carat gold or platinum case, worn with a crocodile strap with an engraved metal buckle. Cabaret The Cabaret is one of the company's most popular designs. It features the patented "outsize date," providing a date that is five times larger than on ordinary watches of this size. The rectangular case comes in 18-carat gold or platinum, worn with a crocodile strap with matching metal buckle. Alternatively, there are jewelry versions available through customized order.